Every new variety has its own characteristics. 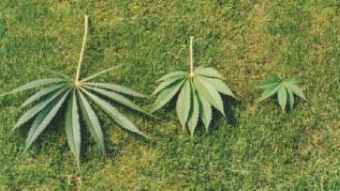 Every variety of marihuana produces its own specific leaves that identify themselves by differences in size, appearance and colour. This was one of my very best hybrids ever. 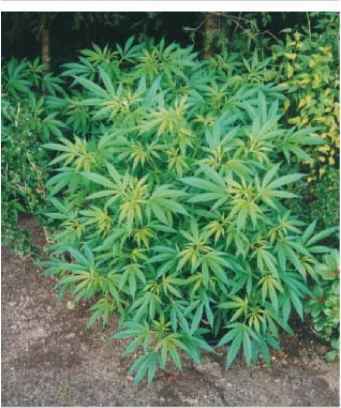 This female plant had already begun in the third week of August to bloom and produced (due to this) an outdoor weed of staggering quality. The growing of good outdoor weed often begins with choosing the appropriate variety to grow in the first place. After all, by no means all marihuana types will fulfil our expectations completely. Certainly when we intend to raise the plants outdoors in damp and sometimes bleak countries like the Netherlands or Great Britain, we are going to have a whole list of requirements for our new variety. That pollination of self-raised female plants can yield a whole pile of seeds is no secret to most growers. Some are already so happy with the outdoor variety they are already using that they would prefer to grow it again next year, given the choice. That's why there are growers who always take a few clones off the best mother plant (before she begins to bloom) and shower them with loving care and the best light they can get out of a fluorescent bulb to bring them through the Winter. All well and good if you have the space and the time. But you can count on the clones not being as powerful as the original mother from the year before. This is because the clones brought indoors and only subjected to artificial lighting to keep growing will actually have gone into "survival mode" - just hung on to life. If we had put the clones immediately under a 400 or 600 watt lamp, then by Autumn we would have been saddled with huge mother plants. What's more, most outdoor growers chose to grow outdoors in the first place because they do not have the space and/or they considered the risk of growing indoors too high. 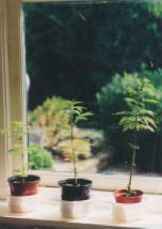 For them it is impossible to be letting clones continue to grow indoors in Autumn. So for them there is no alternative but to start again next year from seeds and hope to get lucky with a mother plant as precious as the one they came across this year. But if we contrive to raise a well-developed male plant from the same variety as a favoured mother plant then we can use this to fertilize the very best developed mother. In this way we are ensured of having a decent outdoor variety again next year from the ample supply of seeds she will produce. By: Weckels, the grow specialist from Atami varieties nightmares: a lovely grow space full of female plants, on which the buds have been getting fatter and stickier. Nothing seemed to be wrong, right up to the day that the air conditioning started pumping a strange whitish-yellow powder all over the flower heads. These same flower heads promptly halted their development, and to the horror of the grower, all began to develop seeds in them. It is good grounds for a failed harvest, since once fertilized, female plants bulge with seeds, sadly making them only fit for the budgies. What's more, the flower heads also develop an extremely sour smell once they start producing seeds, which is the last thing that's going to make someone happy. Even the seeds will offer you nothing in compensation, given that we have no idea what variety the male pollen came from. After all, what use have we of seeds when we have no idea which variety we're dealing with, let alone how long the plants have to bloom, and how the eventual buds will turn out at the end? The drama described above is especially pertinent to growers who live within pollen-drifting distance of industrial hemp fields. 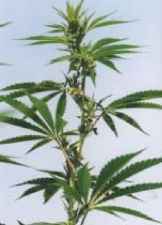 Here the marihuana plants are raised for their production of hemp fibres and the plants are generally harvested before the female flowers have had a chance to form on the plant. Sadly, male flowers often blossom several weeks earlier and as a result can cause total disasters for surrounding (indoor) growers who fall victim to the huge quantities of pollen drifting about. What's more, male plants are far less dependent on the number of hours' sunlight in order to start putting out (male) flowers than are female plants. In other words, male plants are liable to begin blossoming when, for example, it is still the middle of Summer and the number of hours light would have been optimal (for the growth period). Sometimes male plants that have grown in a very poor spot and/or have been stressed for some reason, spontaneously break out into flower. For these mysterious deeds there are no real explanations to be found. This is partly the reason why so many (outdoor) growers have such anxiety about male marihuana plants. This cross is a descendant of a variety with a short bloom period, the offspring of which furthermore very rapidly developed a large size. 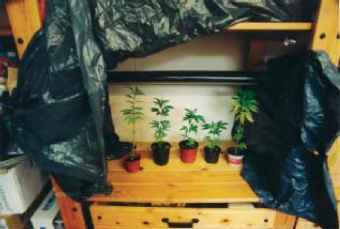 indoor growers some peace of mind that they can protect their ladies to some extent. To return again to the issue of pollination and thereby fertilization of the mother plant. When we know how to collect the pollen ourselves, then we can pollinate the female at a time we choose that's best for us. In place of giving nature free reign, we catch the pollen in plastic bags. There are growers who swear by paper bags, as these let the plant breathe. I prefer the plastic ones myself, given that in our moist climate paper bags can quickly become soggy. Should there have been any pollen in these bags, then it is stuck for good on the wet paper. What's more, it is very important that the pollen remain as dry as possible when gathered and that's going to be a problem if the bag is even a little damp. We let the male plants grow just as the female ones at first. During the growing phase of the male plants we need to make sure that only the best-developed branches are allowed to remain. Only once the plants have started to bloom and the male anthers (in which the pollen is made and stored) are more visible, do I begin to keep an especially keen eye on them. I then remove as many of the leaves as possible, as this will reduce any problems of condensation later when we put the plastic bags over the male flower heads. Stress, as has obviously been experienced by this curled up leaf, can easily trigger the male plant to bloom, irrespective of the hours of sunlight it is receiving. By taking cuttings from male plants and putting these indoors under a lamp to come into bloom (by setting a 12 hour light period), we can collect all the pollen we need early in the year. Once the male anthers are nearly ripe and stand on the verge of bursting open, I place plastic bags over the male flowers and fasten these tight with an elastic band. We need to position the plastic bags like this so that the pollen falls directly out of the anthers and is caught (without it being able to get out of its plastic bag). We also need to bear in mind that the plastic bags may remain over the flowers for at most a day. Were we to leave it on for, say, a week, then we'd have condensation all over the inside, because the male flowers also give off water vapour (just like all other plants). That's also why it's a good idea to check your bags regularly or let them breathe a little, as long as no pollen is actually falling off the anthers. In this way we can prevent ourselves a load of aggravation and we still keep the male flowers in good a condition as possible. This male too has had a few problems, and begun already in June to produce male flowers. Preferably put the males indoors, in front of a window. In this way they are safely removed from the vicinity of the female plants. in the bag. If this is the case I snip the side branch off below the plastic bag (or the main stem if the flowers are at the top of the plant) and take the branch and bag indoors (left in a spot where it won't get shaken). We need to get the pollen out of the plastic bag as soon as we can so that we get our hands on it while it's still as dry as possible. If the pollen gets damp then the chance that it will become a victim to fungal attack is increased. Even when the pollen is good and dry it still has a limited shelf life and its quality drops quite quickly. If you keep the pollen cool and dry you can expect to be able to use it for about a month. Thanks to this short life span it is far from easy to cross fertilize all varieties, given that a late-blooming female variety for example can not be crossed with the pollen from a late-blooming male variety. You can freeze the pollen, which will extend its usability to three months. I usually keep my pollen in small ziplock weed bags. These are ideal for keeping pollen in since they are small in dimension yet can still be sealed still air tight (by clicking the two upper sides of the bag together).
] It is all well and good that these males are already safe behind glass, since a number of anthers have already burst open (and are lying on the sofa), and could have led to a disaster outside! The anthers are beginning to develop more and more. It will not be long before the males will be spreading their pollen around. 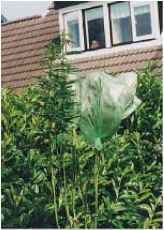 When we choose to let the male plants mature outside, we can best capture the pollen with a plastic bag. Cover up the male flowers one by one. This is how the plant looks when we have covered all the male plants with plastic bags Prevent condensation in the bags by airing them (or replacing them) regularly. more, it would be horrific to have put together a really top class variety, and then never be able to recollect what combination of varieties you had used to create it. It is also important that we always save enough pollen from a good male plant. If our new hybrid is for some reason a disappointment, then it is always handy to be to take a step back as a grower and use the original pollen to fertilize a different female marihuana variety. Only with such a well-organised way of working can we reduce the number of crossing that go wrong and increase our chances of success! In this photo we can clearly see that the anthers have burst open. The pollen is already on the leaves. Sometimes I pinch off the anthers when they are nearly ripe and put them in a plastic bag. If you do this, make sure everything is good and dry and the pollen will work wonders. example. Doing this will bring the male clones into bloom much earlier (for example, in July). The big advantage of this is that the male plants can pollinate as much as they want, the surrounding females (that are getting the normal amount of light) still show no sign of blooming and carry on growing with no danger. 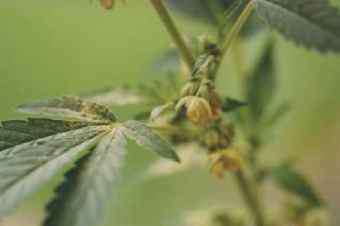 This is why I would firmly recommend this method for the beginner outdoor grower, since small mistakes in which small amounts of pollen are released are not immediately and mercilessly punished (by way of a trashed harvest). We can adapt the above techniques and choose the best developed female plants to take cuttings from and put these under lamps (with a 12-hour cycle) with the male cuttings. When we get female and male clones flowering, they can fertilize each other and give us more than enough seeds. To come back once more to the male clones. The biggest advantage of male clones is that you can set them to bloom nice and early. It goes without saying that the male clones, since they take up so little room, can easily be planted with other male clones of other varieties in a single, small space. It is of course much easier to, for example, put five varieties of male clones into bloom than it would be to put five large, fully grown male plants. 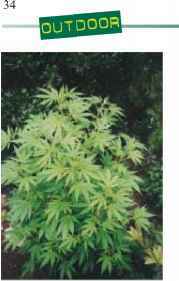 In addition there is the advantage when raising five males clones each of a different strain that the creation of new hybrids proceeds much more easily. Of course you have to take care not to mix the pollen from the different males. Usually this is not a problem since each variety has its own specific bloom period. In short, the male plants are unlikely to bloom at the same time and so the chance of the pollens becoming mixed up is small. Once we have taken enough clones from the large male plants we can in principle get rid of them, since the clones will give us more than enough pollen. Most outdoor growers are not exactly champing at the bit to raise male plants, in fact most would be happy to see them consigned to the deepest pits of hell with no hope of parole. Which is actually a shame, because a well-developed male plant to some growers (especially the real fanatics) is a treasure to be cherished. 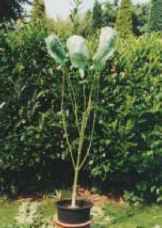 Male plants, especially well-developed ones, are much more rare than most growers think. Whenever I hear from fellow growers that they are about to destroy all their male plants, I usually try and beg a clone or two from them first, so that I am assured of getting my hands on yet another new variety. The nice thing about this growing practice is that we can make cross fertilizations that are normally nowhere to be had. 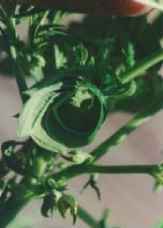 That's one thing that makes cross breeding hemp varieties so special, as you never know in advance what sort of flower heads your new variety of females are going to deliver at the end. It was in such a way that I once crossed a number of breeds to create an outdoor variety the female plant of which needed hardly any time to in bloom to create really good flower heads. What's more, this variety was already in bloom in the third week of August and that meant that eventually the flower heads were literally bulging with THC threads! I personally save pollen from male plants mainly for experimenting with. What could be more satisfying than putting together the ideal outdoor variety that fulfils all your desires in a weed? I'm a big fan of short blooming plants that produce qualitatively good buds and preferably reach a pretty good size. I have also once or twice grown plants on my balcony, in which case I prefer to choose a small, compact plant that grows with a strong stem and side branches. In this way the plant can better withstand strong gusts of wind, something that you can be troubled with much earlier in the year when growing on a balcony. I should add here that making cross fertilized hybrids yourself can also lead to disappointment. It has happened to me too: you think that finally you have created some sort of super variety for outdoor growing and then she goes and needs ten weeks in bloom. A small calculation will quickly show that if the plants only come into bloom in early September then at the very earliest it is going to be mid-November before they're ready to harvest. 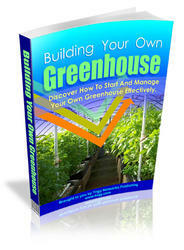 If you are not in a position to use a warmed greenhouse then we can best forget all about raising such a long-blooming variety. One other reason why growers sometimes want to save pollen is to make a cross breed that grows well in the wild, with no overly-high expectations of it and that can just be left behind to grow unobtrusively. In addition, for me there is the important motive of pure curiosity. It is of course every time a surprise to see what the new cross-breed is going to give us next season. A little bit of experimentation can never do any harm, and who knows what kind of super-cross we might come up with! In the next article I'll be paying all my attention to a method with which we can raise the rather longer blooming varieties, even in our sometimes dreary climate. What we have to do and how we can make it work, I'll reveal in the next issue. Once we have stuck the whisks through the holes in the plank and clicked them into the mixer, the mixer will be easier to keep in place while it works. We fill the bucket with trim waste, then we fill the bucket half full with water and finally, spread ice cubes on top. Once we have allowed the trim waste to become nicely soaked, we put the plank with the mixer back on top of the bucket and we're ready to begin'. How do we make Nederhash? 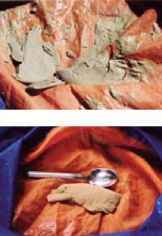 In this issue, I am going to tell you exactly how in detail you can make a superb quality hashish with the aid of just water, ice and an Ice-o-lator. There is no better method than this for making such excellent hash. The quality is so excellent that it is no exaggeration to describe it as one of the best in the world. This is also one of the reasons why so many Dutch coffee shops jump at the chance to get hold of an expensive, exclusive hash of this sort. The reason why the price of Ice-o-lator hash is so high is due to the fact that the whole process of making it is so work-intensive. I once spent a good two hours just to end up with a small lump of a few grams. However, the quality of it was so good, it is quite understandable why so many growers do have a go. The reason why the quality of nederhash is so good is that, with this method making it at least, only the purest THC crystals are kept. 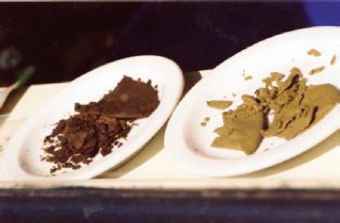 When in the past we used an apparatus like the Pollinator, although the quality was good, there tended to be - especially with lengthy operation of the hash maker - fine, pulverised leaf material also making it through the sieve. This problem is not a consideration when using the Ice-o-lator, since everything that is not THC crystal simply remains floating in the bucket and never makes it to the first sieve bag. The THC crystals once they are in a frozen form are nice and heavy compared with leaf material, and it is their weight that draws them through the first sieve bag, where they eventually accumulate in a very fine sieve. It is therefore a very simple principle, but you can well imagine just how pure a hash this method makes. richly bedecked with a thick layer of THC crystals. This trim waste is what's left after manicuring indoor-grown buds, and is often simply thrown away by many growers or left to rot on the compost heap. They would be much better off just giving it to a grower who has developed the making of top quality nederhash into a nice little hobby. 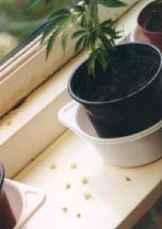 For that matter, there are also very good results to be had using the trim waste from weed grown outdoors too. Especially since outdoor growing often creates a lot of small buds (from off the lowest branches) that can be harvested, and which are excellent for using in an Ice-o-lator. 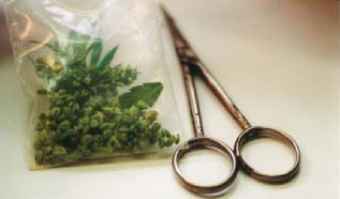 When we are doing so, it is important to make sure that these little buds are well chopped up, so that the THC crystals easily shake loose during the whole process. So, in order to end up with a great quality nederhash, first of all we need to accumulate the necessary trim waste. Before we can actually get down to work we need first to make sure that this trim waste is well and truly chopped finely (for example with scissors). In this way the crystals will more easily drop free from the waste at the moment that they freeze. Once the trim waste is good and fine, we put it in the freezer so that it is ready to use the moment we get hold of the Ice-o-lator. We also freeze a load of ice cubes in advance (preferably a good quality), where we can also stick a few cooling bags or blocks as well. But before we get underway, let me tell you a little about the Ice-o-lator itself. The Ice-o-lator consists of a large bucket (with a 20 to 25 litre capacity), two sieve bags (a rough one and a very fine one), a mixer and a plank. this with cold water. 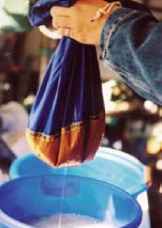 If we were to fill the bucket first with water and then try and suspend the bags, then we'd find ourselves with a pretty difficult task, since air gets trapped under the sieve bags and is very difficult to get out, and which makes them bob around in the bucket. As a result the mixer would not be able to turn properly, and it can easily tear the finest sieve. Once the sieves are hanging down nicely, we fold the edge of the bags over the bucket and pull their cord good and tight. This is of great importance, since if the rough sieve bag is not well enough secured to the edge of the bucket, then trim waste can get into the mass of crystals that are accumulating in the fine sieve bag. If this happens then we have to start all over again from the beginning, and that ensures a whole heap of hassle, annoyance and time wasted. By scrunching and kneading the hash ball we break up the crystals and in doing so release the hash oily the nederhash will get ever darker in colour and come to smell (for its lovers) divine. After a considerable amount of churning, the water changes in to a green slurry, which we don't throw away but can save and use as an excellent fertilizer for our marihuana plants. sieve bags now that these are not sitting snugly against the side of the bucket any more but bobbling against the mixer and its whisks. If this happens, it can turn into a pretty expensive mistake, since the sieve bags are one of the dearest parts of the whole Ice-o-lator set up. The sieve bags are of an unusually good and fine quality - they have to be or they would not be able to catch the THC crystals. Once we have let the rough sieve bag become empty for the first time, we take out the trim waste and put this into a tub for convenience. Then we freeze it once again. Once we have removed the trim waste and the rough sieve bag from the bucket, we let the water in the fine sieve bag slowly drain out. In total I run the mixer; with pauses (every 15to 20 minutes) of about 5 minutes, for a good one and half hours. distincti ve odour, believe me, you'll not want it sloshing all over your floor. Once we have filled the bucket with water, make sure that the trim waste is well and truly soaked, which will turn it into a nice slurry. It is vital that we keep the water as cold as possible, the ideal temperature being between 3 and 5 °C. In order to create this optimal temperature we use the ice cubes and cooler blocks we previously froze in the deep freeze to make the water as cold as we need. I place the cooling elements between the outer sieve bag (on the outside) and the inside of the bucket. Take care that they stay in their place so that they do not push the sieve bags against the whisks of the mixer. The ice cubes are spread among the trim waste, and since these melt they can not do any damage. I usually let the ice cubes melt first and mix in with the trim waste before I proceed, which takes in total about 10 minutes. Before we let the mixer start its work, we first have to make sure that this is positioned so that the whisks can turn without restriction. The best way of ensuring this is to bore two holes through a plank and push the arms of the whisks through them. Then we click the whisks in place in the mixer and we can begin. The plank holds the mixer in its place and thereby also balanced. I used to also bore holes in the lid of the bucket, but this had the drawback that the whisks tended to whirl at a slant, which meant they easily got tangled up with the sieve bags. Besides this damaging the sieves, it could also easily make the mixer overheat. Once the mixer is whirling, the whisks make sure that the trim waste remains in motion, which in turn means the THC crystals can more easily fall loose and to the bottom of the bags. These THC crystals pass through the rough sieve and are caught in the finest sieve, which we then just have to allow the water to drain from. We do not let the mixer do all its work in one go, but turn it off after 15 to 20 minutes, so that the water comes to rest and give the crystals the chance to fall to the bottom. This also has the advantage of preventing the mixer from overheating. In total I run the mixer, with pauses (every 15to 20 minutes) of about 5 minutes, for a good one and half hours. Once you have let the mixer run for this long and turned it off, we let the water stand for about a quarter of an hour (so that all the crystals have sunk to the bottom). We then remove the mixer and the plank, so that we can easily remove the sieve bag (which contains the trim waste ) from the bucket. We lift the rough sieve bag carefully up and let the water drain out. Once the water is out of the sieve, we place the sieve and its contents to one side. We do not throw it away, but freeze it again once more, so that we can put it through the process for a second time. I have sometimes had trim waste in which the crystals were so firmly stuck to the leaves and small buds that they were hard to get out. After I had re-frozen them and put them through the whole process a second time, I noticed that the second time, a lot more crystals had been shaken from the leaves, and they were of outstanding quality too. With the aid of a small spoon we scrape the mass of crystals together. This is much easier than trying to do it with our fingers. it will stick. Once this has happened, it is almost impossible to get the crystals out of the bag. We therefore let the water drain out in its own time. One method we can use to speed this drainage up a little bit is to grasp the sieve bag in two hands and to repeatedly rock it with our hands, gently moving first the right and then the left hand up and down. Doing this will make the mass of crystals move on the bottom of the sieve bag from left to right, which will give the water more openings in the sieve through which it can seep. Once the water has drained away, we fold the sieve bag in half, so that the mass of crystals is surrounded by gauze (from the sieve). Now we lie the gauze between a thick layer of serviettes or towels and stand on top of it. 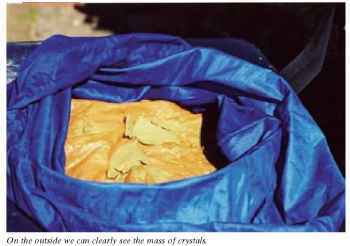 By the weight of us pressing it, the rest of the water is squeezed out of the sieve bag and so out of the crystal mass too, so that finally there is nothing left in the sieve bag except a brown substance, the crystal mass. This pure blob of THC crystals can most easily be removed from the sieve with the help of a small spoon. It is certainly easier than doing it with your hands. There is a certain art to squeezing the quantity of scraped and spooned THC crystals into a ball. Especially in the beginning it looks as if it is not going to work and will merely be another exercise in frustration. This is a fair assumption, since the temperature of the THC crystals is much too low for them to be able to start sticking together. It is far better to start by placing the THC crystals on a plate, so that the temperature of the crystals rises so they stick to each other better and we can form them into a single ball more easily. We can also stick the plate in the sun briefly, or above a radiator. While I am letting the mass of crystals rise to a decent temperature, I tip the bucket of water onto my other marihuana plants. 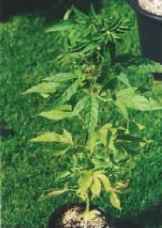 The brown and sometimes even green-coloured water is an outstandingly good fertilizer for marihuana plants; they are crazy about it! Never let the hash crystals stand too long in the sun (or on central heating), or the accumulation of crystals will dry out too much and then it will be hard to press them into a ball. On the outside we can clearly see the mass of crystals. Here is the eventual end product. Although the nederhash balls shows a number of cracks from the drying process, the quality is still fantastic! With some varieties of hash, it can be impossible to knead the mass of crystals into a single ball. Sometimes a plastic bag (or cellophane wrapper) bring about a change. to regularly clean our sieve bags with alcohol. It works best when we splash some alcohol on a plate and dip the underside of the sieve bag (where the hash accumulation is) in this. We let the alcohol work its way in, so that the hash deposit is well worked loose. Once this has happened, we can rinse the sieve well in warm water. Do this very carefully as we do not want to face the consequences of next time, and the near 100% alcohol coming into contact with the sieve full of crystals! It is important that we clean the sieve bags regularly with alcohol. 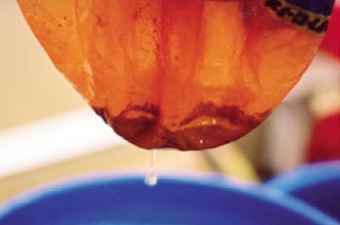 In this way we can prevent the sieve from becoming blocked so that next time we use it the water will not dribble out. in doing so release the hash oil, the nederhash will get ever darker in colour and come to smell (for its lovers) divine. I repeat this kneading of the hash ball several times, and in this way make sure that pretty much all the crystals are broken up, and the quality becomes exceptional. work has gone into producing it. 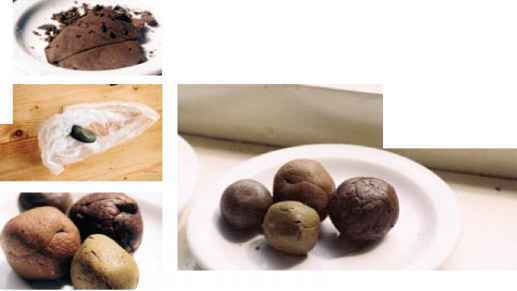 In addition, drying the hash balls properly has the advantage that we can then store them for long periods of time. Since the quality is so extraordinarily good that we need just a small amount to roll a right royal joint with, it is handy if we can store our nederhash without any worries. mass of crystals that you placed on a plate in the sun or over a radiator; the crystals can dry out and/or discolour very quickly. If the crystals are allowed to dry out too much it can be a hell of a job getting them to stick together into a single ball, and if it happens you are best off adding a little moisture back to them so that you have a second chance at it. smoke more smoothly. Never stick the hash balls straight into a plastic bag as the chances of condensation are still high, and if this happens, then the risk of mould (yes, the hash balls can go mouldy) is considerably increased. HAPPY WAPPEii previous time). Filling the bucket afresh, having first hung the sieve bags in it, has the big advantage that there will be no air pockets under the bags. Once the sieve bags are again hung in the bucket and this has been filled again with cold water and ice, we take the sack of trim waste back out of the freezer and empty it back into the sieve bag, and the whole process can be done again. Once you have kneaded a lovely, round ball of nederhash, place this in the freezer for a few hours. By freezing the ball of nederhash any final traces of water are forced out and remain on the outer surface as a layer of ice. Once we take the ball out of the freezer, this ice can be easily wiped away and we will have removed pretty much all the moisture from the hash ball. During the drying of the balls of nederhash, you will notice that the hash pretty soon begins to crack as it dries out. It is important that we continue to keep squishing and kneading the ball into a round shape, as long as there are still cracks to be seen. If we do not, then the hash also dries out in the inside and eventually the ball will fall apart. Over a period of use the water will cease to dribble out of the sieve bag, or it will seem to take an eternity before it is finished. At a certain moment the water growers and anyone else in the green business a good new year, and a 2005 that will be rich in blooms! Weckels is a photographer and grow scene reporter for a number of Dutch magazines. He has achieved a certain fame in the Netherlands for his coverage of (indoor and outdoor) weed production, specialising in the documentation of outdoor plantations. Here, Weckels will discuss the growing of marihuana indoors. Take advantage of it!